Earth Day - 10 Patterns to Save the World! As I’m sure you know, Earth Day was yesterday, but doing right by our home planet is an every day activity. We have to take care of the Earth – it’s where we keep the yarn! 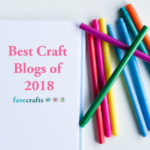 So in addition to reusing, recycling, and re-purposing, here are 10 patterns that will help you be eco-friendly and eco-crafty (and you might even save money while you’re at it)! 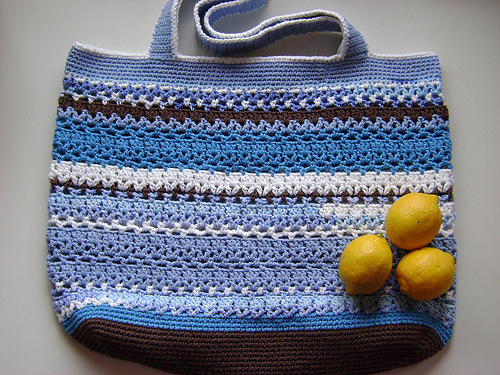 The Lacy V Shopping Bag pattern is one of my favorites for a sturdy, large bag – and bonus, it’s so pretty! Perfect for items that would fall through the mesh of a string bag, for stuff you don’t want the whole neighborhood to see, a trip to the open air market, or even for just throwing towels and sunscreen into before you head to the pool. Here’s one I made for a school “Summer Fun” fundraiser! 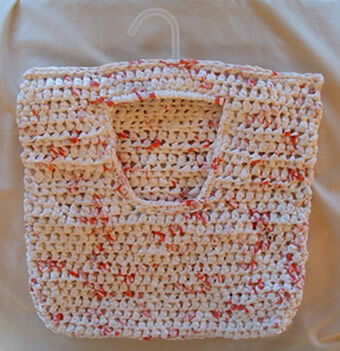 The Hana Hana Cotton Summer Bag is another handy one to have in your arsenal – sort of like the opposite of the bag above! It’s mostly mesh, which makes it lightweight and easy to stash in the bottom of another bag or purse, and it stretches to accommodate a lot more than you’d think! The handle is thicker than that found on many mesh bags, making it very comfy to carry, even when full. I’ve made two of these: one to give away and one to keep. 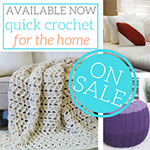 They’re fun and fast, and take just one skein of kitchen cotton, such as Sugar’n Cream! 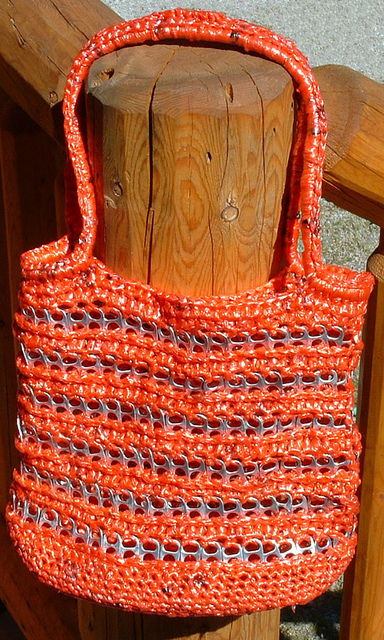 If you really want to go green with your bag, I think the Plarn Pop Tab Tote Bag takes the prize! Very impressive. 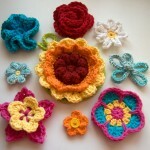 I haven’t made one myself, but this is inspiring – I might have to give it a go. Besides plastic grocery bags, plastic water bottles are one of the biggest eco-problems. 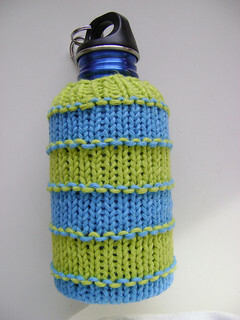 So if you’ve picked up a reusable water bottle, kudos! 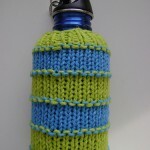 Now make yourself a pretty cover to deal with the condensation this summer and you can stay hydrated in style. 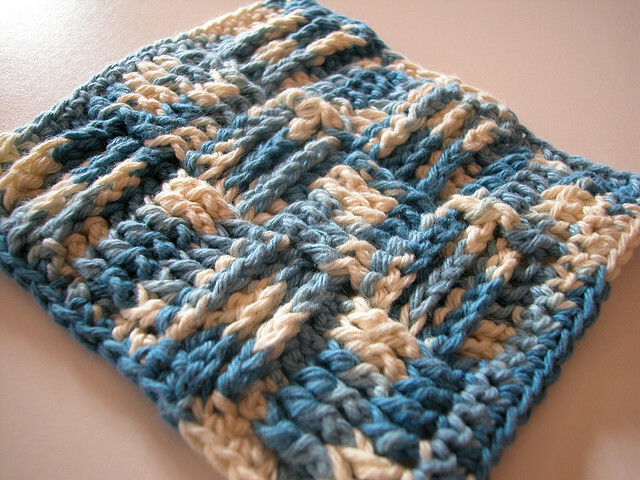 This pattern looks great worked up in your favorite sports team colors! 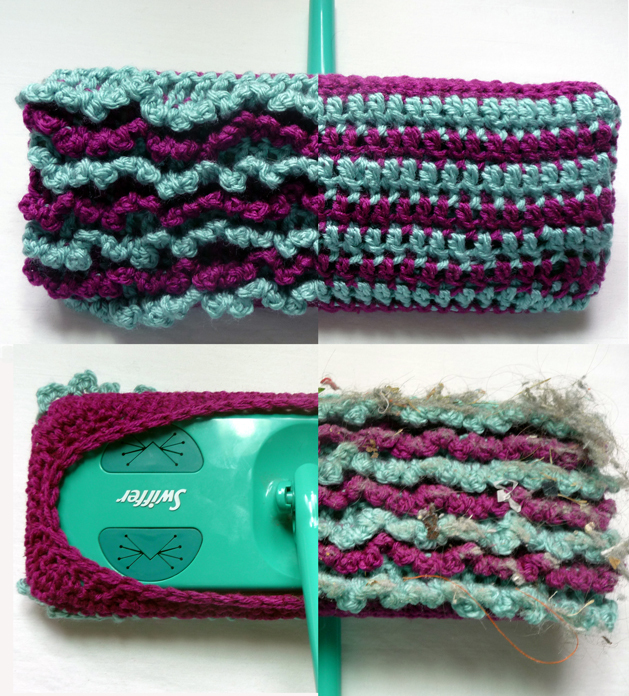 The Reversible Swiffer Sock is a great one for those of us who bought the Swiffer Sweeper or similar products without realizing how expensive (and wasteful!) it is to buy all those specialized towels and wipes. 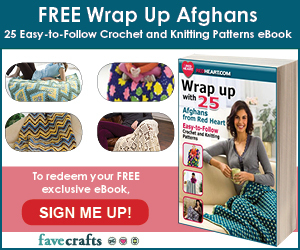 Now you can make a few of your own washable covers and clean guilt free! I need to add this to my queue for sure. 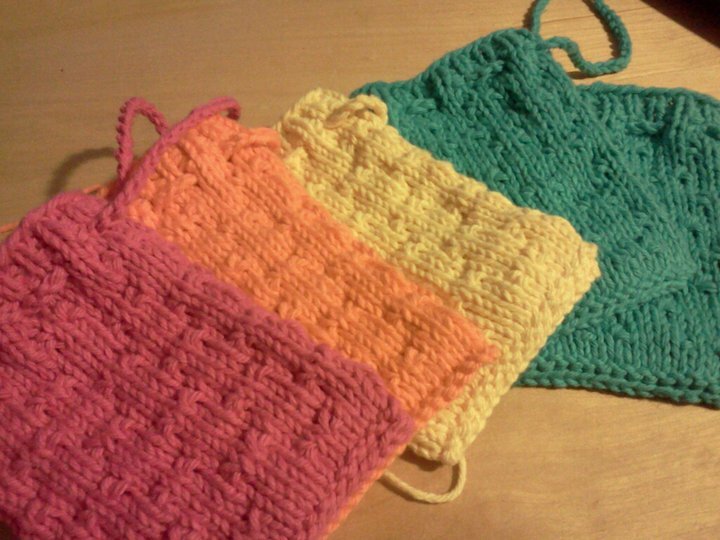 Speaking of cleaning, the Basketweave Scrubby Cloth is the first pattern I ever wrote – and we’re still using the original in my kitchen, several years later! It’s a great texture for everything from countertops to grimy kid faces, and it was how we started being able to go paper towel free. Yet another kitchen tool that comes in handy is the dish scrubber – even the newest dishwashers can’t take care of every mess (alas!). 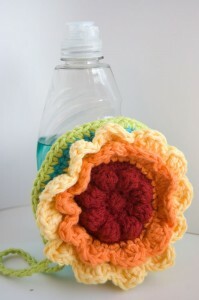 So if you haven’t before, check out the Rainbow Flower Scrubby Dishcloth and maybe you can skip the sponge. How’s this for a double whammy? A Plarn Clothes Pin Bag! 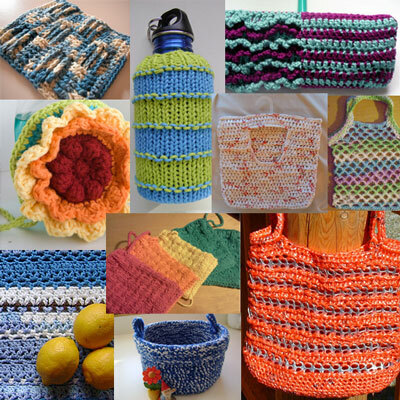 I could make the whole list from the My Recycled Bags website – be sure to check it out, it’s full of great green patterns and ideas! There are dozens of free soap cover patterns available out there right now – and what better way to be eco friendly than to make what you’ve got last? 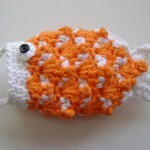 These also make great gifts, when paired with a gorgeous bar of handmade boutique soap. 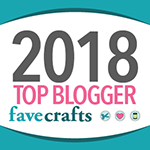 My personal go to is Bean Tree Soap – I’ve used her bars myself and have given many as gifts, and they’re all just gorgeous. Can’t recommend them enough! Last year I did end of the year teacher gifts of soap from Bean Tree paired with Little Dragonfly Soap Sacks. Now, hiding down here at the bottom… can we all admit we have it? That stash of scratchy, rough, or squeaky yarn, the skeins we ignore at the bottom of the shelf but keep around “just in case.” You don’t want to wear it, but you can use it and love it – turn it into a container! I’ve had the best luck turning that stiff stuff into pretty bowls and boxes. So don’t buy still more plastic bins – use what you already have to make something much easier on the eyes, wallet, and planet. Here’s a Crochet Basket I made with some rough random wool I inherited mixed with a leftover skein of acrylic. 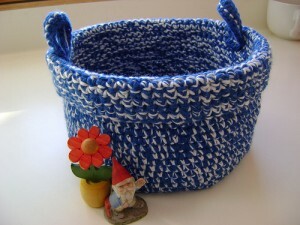 I hated the yarn, but now I love the basket! So tell me! 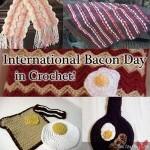 What have you knitted or crocheted to cut down on waste in your house, go green, or save money? What do you plan to do in the future? Be sure to check out and like the moogly facebook page to get all the latest updates, fun links, sneak peeks, and more! What a great group of useful patterns. Thanks! You are very welcome! 😀 Thanks for reading! The pretty Hanna Hanna bag pattern is not in english. Do you have one? I love it. 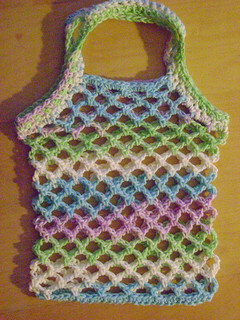 No, I’m afraid Pierrot has only made the pattern available in Japanese, but it is charted using standard crochet symbols. I can’t view your videos. It just says unavailable. All the videos? Eep! I’ll have to take a look – thanks for the heads up! Hm, they seem to be working for me. Maybe it was a temporary youtube thing? I love the Hana Hana Cotton Summer bag, however, the pattern comes up in Korean. Unfortunately, I have not yet mastered that language. 🙂 Can you direct me to an English version of the pattern. Thank you for sharing all of these wonderful patterns! I’m afraid that one’s only available in Japanese! 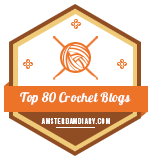 But it’s charted in standard crochet symbols. 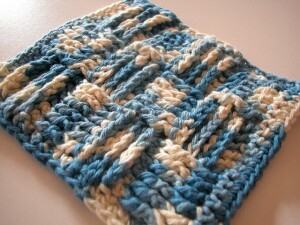 If you’re not familiar with crochet charts, there’s a good series on reading them here: http://www.craftyminx.com/2011/11/crochet-school-lesson-21-reading-crochet-charts.html It’s easier than it looks! Is there another link you can provide for the pattern? Thank you. Hi Jeanne! 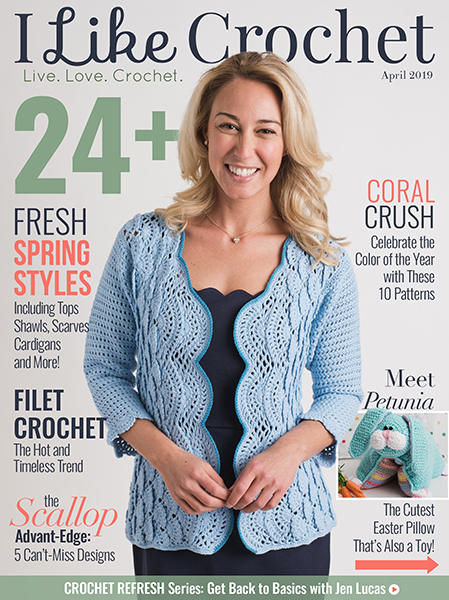 I was able to find a link through the web archive: http://web.archive.org/web/20120904135153/http://www.stypecreative.com/knitting/littledragonsoapsock.pdf Fortunately the download still works!